Renting Business Ideas – Do you want to start a business that generates a regular income whether you work or not? If YES, you can think of starting leasing or renting business. Starting a renting business is one of the smart and lucrative ways of earning money. The concept of this business is simple, ownership of product or equipment lies with owner and owner is paid for usage. Leasing and Renting business has become a profitable business option due to many reasons. Firstly, the affordability of people and their preference. Most of the people prefer luxury but everyone can’t afford it, so they prefer taking it on rent. Second, people have realized the value of money. If a product is available on the rent they opt for it, especially when it is used only for once or rarely. Thirdly, many businesses opt for equipment on rent instead of purchasing. So, it makes sense to start leasing and renting business. Remember, the startup cost of starting renting business depends upon product, space, and services that you purchase for rent. There are two types of products that are involved in the renting or leasing business. Movable assets and immovable assets. Make sure to carry out research before starting renting business. 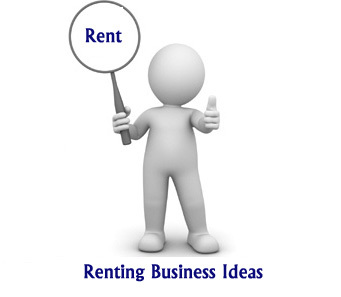 If you have decided to start renting business, here is a list of 20 Popular Leasing and Renting Business Ideas for your ready reference. Air Conditioning rental business means providing air conditioning facility to the client by installing air conditioning machine on rent or offering air cooler on rent. Many people prefer taking air conditioner on rent during summer. Your potential customer in this business would be people who are temporary settlers or startup companies. ATM Space Rental or retail space renting is one of the most profitable business options. A retail space is always in demand. Banking organization always look for ATM space for ATM network expansion. Hence the demand for ATM space is very high. If you have enough capital you can plan to start ATM space rental business. Artificial Tent Renting is next in the list of popular leasing and renting business. In this business, you need to rent a customized tent to the customer. Tents always remain in demand for various purposes like marriage, party, festival etc. The investment required for this business is moderate. High-end audio equipment always remains in demand. Any function such as domestic, social or corporate requires public address system and audio devices. If you have expertise in identifying and managing audio devices you can start audio equipment renting business. If you love reading books you can think of starting book renting business. The business of book renting can include general as well as educational books. You need to have a good collection of books for starting this business. You can earn good money out of this business. You need to focus on marketing strategy for getting success in this business. Another lucrative leasing business is bus rental especially at area where domestic travel is growing. This business requires a lot of capital investment. Most of the people opt for bus rental for tourism and social functions like marriage. Apart from that big company opt for bus rental for transportation of their employees. Car Renting is a traditional business. This business has grown multifold due to Uber and Ola. This business is an ideal choice for the city with a high density population. The primary business model is scheduling customer reservation and supplying car on rental. You can even think of starting an online portal for getting customer reservation. Apart from normal car renting, luxury cars are also in huge demand. If you have a capital for the investment you can start own car rental business. Most of the startup companies and business require a conference room for the meeting, training, and other office related programs. If you are owning space in a commercial building you can convert it into a conference room with audio-visual facility and plan to offer it on rent. You can get a very good return on the investment. Construction equipment renting is a high capital intensive business. A demand for construction equipment is at peak due to real estate and infrastructure development. Construction equipments are costly hence a majority of developer and company prefer to take these type of equipment on rent. Decorators deal with the supply of decorative materials, chairs, stage, and other social function related items. These types of items are always in demand especially during a marriage, party, political party, conference etc. Thus starting own decorator business is a profitable affair. You need to invest a lot of money to start this business. Electric Wheel Chair is required for disabled and handicapped people. It is a social cause but you can make money out of it. This business can be started in part-time also. Fancy dress renting business is low-cost investment business. Fancy dresses are usually in demand at school for celebration of several events and even during several social functions, parties etc. You can start own fancy dress renting business and earn a lot of money. Many businesses opt for rented furniture especially when a requirement is for a few months or years. Rental furniture includes table, chairs, cabinet, desk etc. If you have sufficient manpower and capital to operate this business you can start this business. Make sure to use furniture which is reusable and long lasting. Specialized type medical equipment such as waterbed, wheelchair, and walker are usually in demand. The client mostly prefers these types of equipment on rent as a requirement is for the limited period. This makes medical equipment renting business a lucrative business option. A multimedia projector is very useful equipment used in the conference room for training, presentation and seminar. Educational institute and startup business prefer to take multimedia projector on rent instead of buying it. This makes multimedia projector renting as a lucrative business option. A musical instrument renting is one of the best renting business ideas. As musical equipments are costly, people prefer to take it on rent instead of buying. Musical instruments on rent are required for learning music as well as musical events in office as well as social functions. Office space is always in demand. If you have a provision of huge capital you can start office rental business. You need to select space carefully preferably nearby market. Office equipment renting is another lucrative business idea. This business can be started with a moderate investment. Many start-up companies opt for office equipment for rental. Thus office equipment renting is a very good business option. Sign Board renting is a very good rental business. It is an outdoor advertising business, where you need to give signboard on rent for advertising. This business requires lot of capital and manpower. Study your market. Know what your customer is looking for. If demand in market is high your chance of getting success is high. Don’t buy more, buy smarter. Avoid idle inventory. It will cost you money. Find best deal for product which you purchase of renting. You can think of buying used equipment to save more money. Make sure to complete your paper work. It is very important in renting business. It is desirable to create online presence for increasing business. Make sure to take good care of product or equipment that you purchase on rent. Go for regular maintenance of product. Treat your customer nicely, make sure customer becomes repeat customer. « Thematic Funds, Sectoral Mutual Funds – Good for Investment?